Stage 2 were given a choice of excursions this year to either Rome or Amsterdam. We chose to visit Amsterdam and although the group was smaller, we found the visit an amazing experience. The Meininger hotel was incredibly good value and offered a continental breakfast each morning and for a hotel the most amazing shower! The rooms were comfortable and modern, and the staff were helpful and friendly. The transport system in Amsterdam is extremely good value and we took full advantage, we purchased a GVB Card for €21 which lasted us the whole trip. We could travel by tram, bus or the metro system. During our stay we also walked a lot (an awful lot) and tried to avoid the cyclists who always have the right of way!! The first day we toured the central Stock exchange and the older parts of the town. During the next few days we toured a mixture of contemporary buildings types including The Eye, a film museum and several art galleries. Amsterdam offers an eclectic collection of architecture both modern and old which is nestled together and makes for a very interesting city. The many canals and rivers offer interesting views and the opportunity for boat and ferry rides. Of an evening many of us toured the town in search of restaurants and shops, there is a mix of cuisines available from traditional Dutch (don’t miss out on the opportunity to try the local cheese or waffles) to Argentinian, Chinese and Italian. Amsterdam has a certain reputation as a tourist destination but offers so much more especially to architecture students. An exhilarating and inspirational city. The residential buildings were definitely a motivation and provided great precedents for our current module Collective dwelling. Luciano Cardellicchio and Chris Gardner accompanied us on the visit and made great tour guides, they were not only entertaining but also informative. We found this trip to be very educational yet enjoyable and being a small group meant we got a lot out of it. 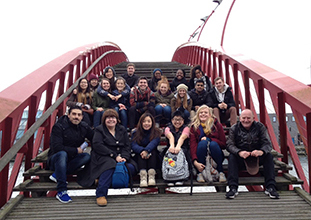 In February 2014, Stage 2 students were given the opportunity to visit either Amsterdam for modern architecture or Rome for Renaissance and Baroque architecture. This review is about Rome where we had the chance to explore historical architecture, exotic music, delicious food and a lot of Italian coffee! We arrived in Rome early evening and before officially beginning our trip, we had a chance to explore the city on our own starting with a delicious Italian dinner, dessert and espresso. We then took a night walk around the hotel area. 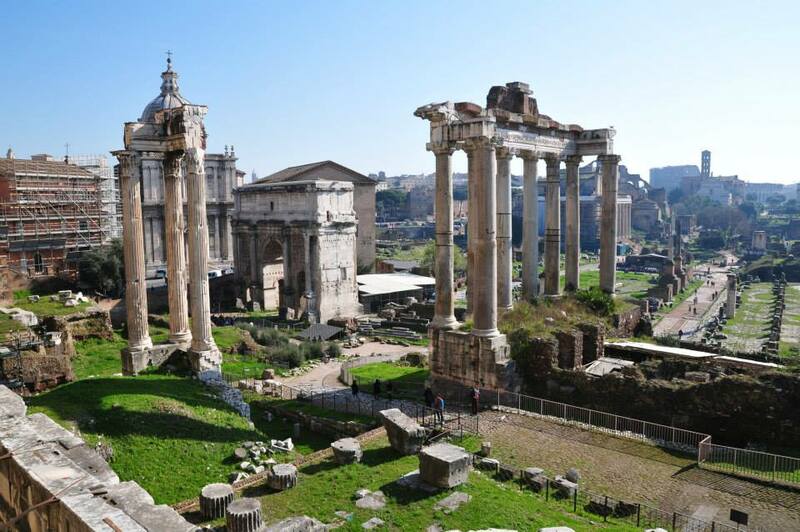 We started our second day by visiting the Campidoglio and took in the panoramic view of the Roman Forum from the top. Pacing along the streets, we visited several churches nearby and then went on to the Pantheon and Piazza Navona. Our tutors led the way and gave “open air lectures” during each tour, we explored almost every street within the city and found that Rome has many different faces. Throughout the trip, we visited many famous and spectacular buildings, churches and museums including the Church of S. Agnese, Palazzo Farnese and Piazza del Popolo. 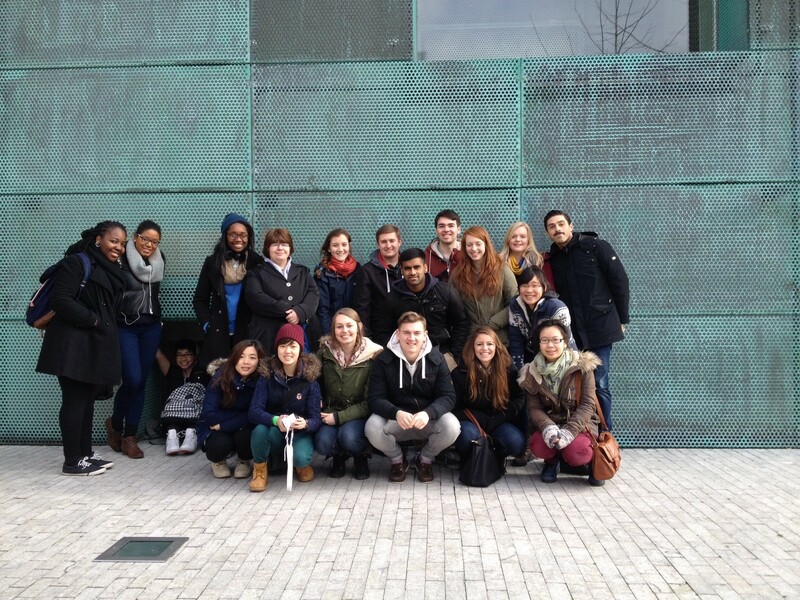 We also looked at contemporary architecture such as the Maxxi Museum. Apart from visiting buildings and taking lots of photos, we were assigned sketching assignments every day and spent hours with our sketchbooks out which has been great for our portfolios. We even had our “sketching crits” in Rome conducted by Dr. Nikolaos Karydis, giving feedback on the sketches we had completed. The sketching assignment also gave us time to appreciate the city. In the evenings, we had the chance to get to know more about Rome by visiting places like the Colosseum, the Vatican Museum, the Capitoline Museum and the Campo Marzio. Apart from soaking up the architecture, we took the tram and subway in our free time to visit open markets and to enjoy various music performances at the Piazza Navona and in front of the Pantheon. After wandering around the city, we used our remaining energy to search for good food. Rome is famous for its pasta, pizza and gelato, you can find lovely places all over the city however the hardest thing to decide is which restaurant to try! Under the recommendation of Dr. Nikolaos Karydis, we also got the chance to taste the best coffee in Rome with our tutors after the end of the fourth day and you could smell the coffee the moment you stepped into the shop. The nearest metro station, which is also the central station in Rome, was within half a mile walk from our hotel. We did however travel mostly on foot around Rome so that we could explore and admire all the things in the city along the way. Stage 1 visit Barcelona in the Autumn term. It is always fraught with difficulties trying to organise a venture such as this so early in the year, but the gains far out-weight the pain. 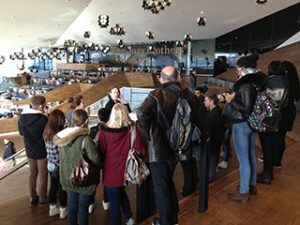 The Architectural experiential benefits at the broadest level of such a visit are without question, but perhaps in parallel with this is the social interaction and bonding it promotes amongst a new cohort of students, the majority of which are experiencing for the first time ‘education away from home’. In December of 2013, many Stage 1 students departed for Barcelona, Spain at some ungodly hour of the morning, an effort however, which was regretted by none. Awaiting us was a week of intense picture taking, gallery viewing, site measuring and not to mention evening socialising. The objective of the trip was not only to record the site for the following term’s Building Design module but also to enjoy some of the main sites of one of Europe’s most animated cities all the while allowing students to build a strong group dynamic. 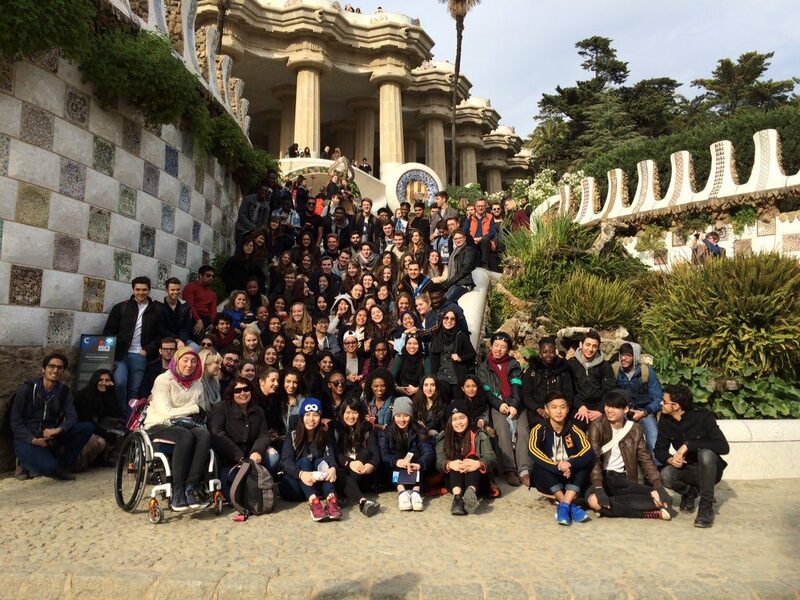 Throughout the course of the week we were able to visit some of Barcelona’s iconic features such as Park Guell, which we were lucky enough to be sketching under some southern December sun. We were also able to experience the masterpiece that is the Sagrada Familia, without forgetting, and continuing with the Gaudi theme, the Casa Milo and the Casa Batilo. All perfect examples of Gaudi’s great impact on the city. Other memorable sites were of course the Ramblas, the city’s center of attraction which leads down through Barceloneta, to the beautiful Port Olympic, home to Frank O. Gehry’s Fish. Along with Barcelona comes not only architecture but also art, and the many impressive Galleries and Museums housing the works of so many, vastly diverse artists. In the midst of our treacherous hikes through the city we made many pit-stops at some of these buildings such as the Fundacio Joan Miro, the Museau d’Art Contemporani (MACBA), the Centre de Cultura Contemporania (CCCB) and many more, where we were able to admire what seems like only a small portion of the artistic wealth of the city as well as modestly attempt to capture these pieces in our own sketchbooks. All educational trips do however include work. On this trip we had the task of choosing our six preferred pieces amongst the immense variety of art viewed during the week. Along side this we were also asked to take six photographs capturing everything we felt about six different places throughout the city, following the style of Roloff Beny. Most importantly however, the recording of the site for our Building Design module allowed us to experience hands-on everything that the analysis of a site entails, from the dimensions of lampposts to the environment the site is in, the current social occupation of the space and it’s current functionality throughout time. Students took full advantage of evenings in the many charming restaurants and upbeat pubs and clubs in and around the city center, being reasonable as ever of course. The profound uniqueness of the city can be sensed everywhere, from the pixelated fruit on top of a market to a bull ring transformed into a shopping center or even a hospital laid out to represent the human body. There is definitely no way to capture how wonderfully charming Barcelona is in words, it’s a must-see, and I think I speak for everyone in saying that we had an absolute blast and that this trip was definitely an unforgettable experience. 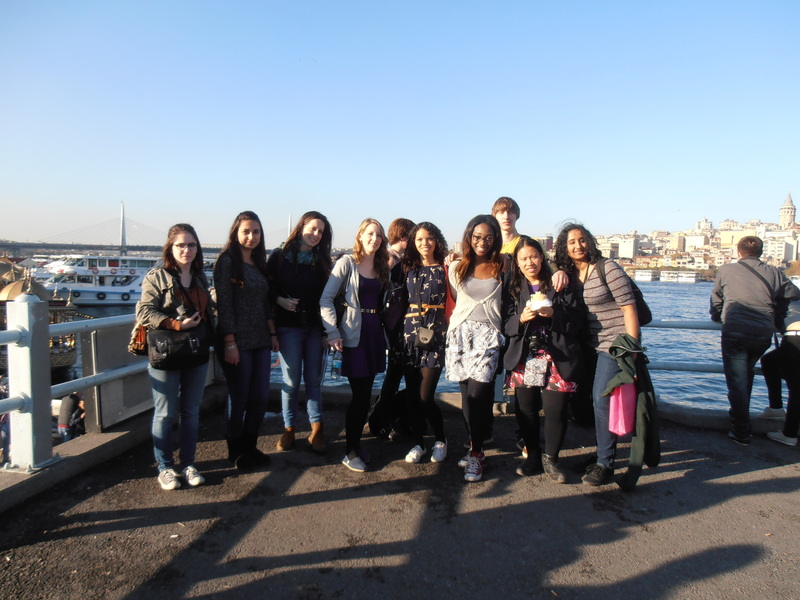 In November 2013, Unit 3 MArch students were given the opportunity to travel to Istanbul, Turkey as part of their Design 4A project. The objective was to study this vibrant city as an ‘emergent urbanism’ and focus on the culture, activities and history that define the city today. The chosen site was located in Tophane; a location that has been subject to rapid social and urban changes, resulting in conflicting perceptions about the area. Whilst studying the site and the surrounding context, students were expected to think about the phrase ‘Made in Turkey’ and what products or processes add ‘value’ to how the city is portrayed. The first day was spent at Istanbul Technical University, where Kent students teamed up with Turkish MArch students and the two parties provided effective feedback on each other’s projects to date. The day-run workshop proved most useful in learning new urban tactics and getting a different perspective on designing an intervention in a city. With this newfound knowledge gained from the ITU students and tutors, the Kent Marchers proceeded to look into mapping Istanbul through the use of photography and all-important sketching. One of the biggest challenges was taking a boat trip along the Golden Horn River and having to quickly draw a set of coherent sketches along the way! The trip wouldn’t have been complete without getting the opportunity to visit some of Istanbul’s gems, such as The Blue Mosque, Topkapi Palace Museum and Hagia Sophia. These stunning landmarks that span the centuries helped the students to observe in depth the architectural language that Istanbul had to offer. Not forgetting the Grand Bazaar and Spice Bazaar, where souvenirs, snacks, jewellery, clothes and much more were aplenty. Some of the students even held their own when bargaining a good price with the locals! One of the newer places to visit was the Istanbul Modern Museum, which gave a contemporary spin on exhibition space and the modern artistic artefacts which can easily be compared to that of Tate Modern in London. The nightlife was buzzing, particularly Istikal Caddesi High Street, where the students indulged in delicious Turkish food (and drink!) while admiring the city lights and views. Istanbul is a developing city that is highly recommended to visit and the students certainly had a terrific time being introduced to it, as well as becoming familiar with the site that has been chosen for their upcoming design proposals. A final thought: the freshly squeezed pomegranate juice, which was sold practically everywhere, was absolutely refreshing in between the long, exploring walks!